NCAA Women's Final Matches Two Undefeated Teams : The Two-Way For the first time in history, two teams meet in the NCAA women's title game with perfect records. Not for the first time in history, two coaches face off who don't like each other. UConn and Notre Dame will bring perfect records into tonight's NCAA women's final in Nashville. You know a game is special when it makes the record books before it's played. 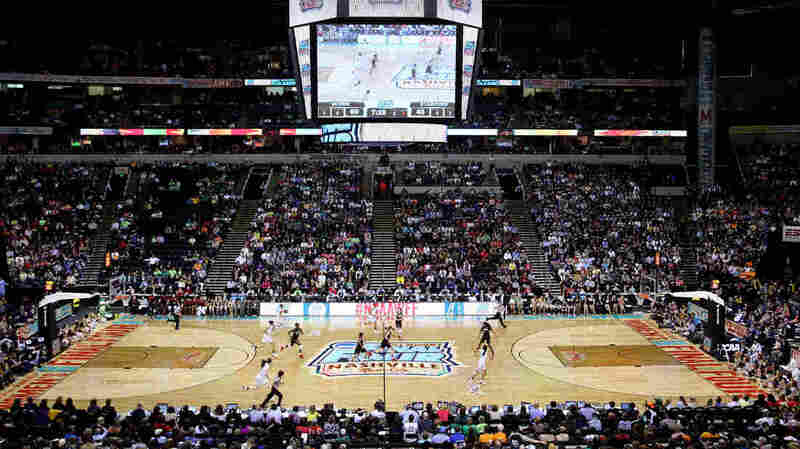 That's the case for the NCAA women's title game, which will feature two teams with perfect records for the first time in history Tuesday night. The AP says that's a record for any NCAA tournament title game, played by men or women. The NCAA says this year will also mark the second time the women's champions from all three divisions have gone undefeated. The game between UConn and Notre Dame will tip off at 8:30 p.m. ET; it will be broadcast on ESPN. Together, Notre Dame (37-0) and UConn (39-0) have half of the recently announced 10-member WBCA Coaches' All-America team. Those All-Americans include UConn's Breanna Stewart, Stefanie Dolson and Bria Hartley, along with Notre Dame's Kayla McBride and Jewell Loyd. While the lead-up to many title games is marked by heated words from players, it has been comments from the coaches — widely seen as two of the best currently working in women's basketball — that drew the most attention. Notre Dame coach Muffet McGraw, who was recently named the AP coach of the year, said Monday that relations with UConn and coach Geno Auriemma are past the point of civility, particularly after Auriemma failed to show the Irish any respect after being beaten by them. Asked if the word "hate" might describe the feelings that now prevail, McGraw said, "I think that is a fair assumption. I think it is a fierce rivalry." The whole subject is "nonsense," UConn's Auriemma said. "Sometimes we act like girls, like we're supposed to go to dinner every night. We're supposed to play each other, try to beat each other's brains in, try to win a national championship and compete like hell, Muffet and Geno. And then we're supposed to get together afterwards and go have a bottle of wine? That s - - - is just not going to happen." The verbal sparring supports the old maxim that familiarity breeds contempt: UConn and Notre Dame are about to play each other for the 16th time since the 2009-'10 season, as Sports Illustrated's Richard Deitsch notes. And he adds that the teams have met in the NCAA tournament in each of the past four years. Whatever you make of the coaches' rocky relationship, they both seem able to see past it. "I think it's something that everyone's looked forward to all year long," McGraw said of the looming matchup, according to ESPN. "People were hoping we would end up here. It's great for the game, and I think it's great we're both undefeated coming into it. It should be a great matchup for women's basketball." Auriemma agreed that the dream matchup of two undefeated basketball teams could help grow the women's game. "An awful lot of people might tune in Tuesday night that wouldn't normally tune in," he said. "A game on national television between two great teams, nothing could be better for the sport."